Are autos the new smartphones at Mobile World Congress 2013? LAS VEGAS—When you buy a smartphone, one of the biggest draws (or drawbacks) is the platform’s app store. In the next year or so, the same purchasing philosophy may apply to cars, too. Automakers have had fancy in-vehicle infotainment systems in their cars for several years now, but they’re finally ready to open those closed ecosystems to third-party developers. Both Ford and GM launched open-source developer programs for the SYNC AppLink and future MyLink platforms, respectively. That’s right: The open-source car is finally here, and thank goodness it’s nowhere near as dangerous as it sounds. Ford wants third-party developers to create mobile apps for its AppLink infotainment platform. 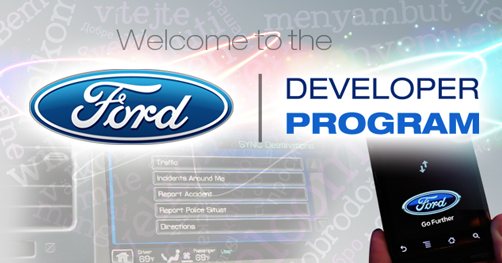 Ford: Mobile developers, we want you! Ford was first, by just a few hours: On Monday afternoon, the automaker announced that its third-party developer program (cleverly named “Ford Developer Program”) was open for business. The company wants third-party software developers to start developing mobile apps that can interface with its SYNC voice-enabled AppLink infotainment platform. 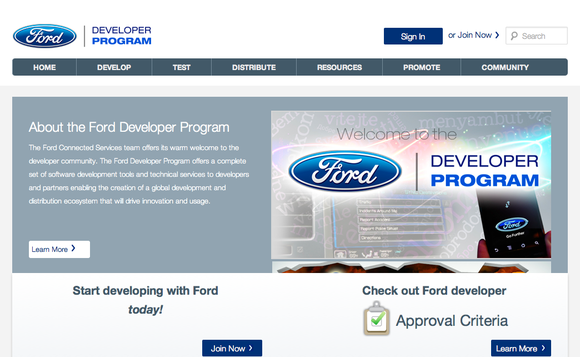 Ford’s actual developer program isn’t all that unique, but its AppLink platform is. Unlike other in-vehicle infotainment systems, AppLink is specifically designed to work with smartphones. So, instead of developing an app for the AppLink platform, developers are encouraged to develop smartphone apps that will work with the platform, once a customer’s smartphone is plugged into the car. Ford's AppLink program is specifically designed to work with smartphones. Ford hopes this approach will drive innovation, because mobile developers will develop apps on the platform they prefer, rather than learning an entirely new platform. Ford’s SYNC voice-enabled technology also brings voice recognition and voice control to apps, even if those apps don’t normally have such features. Just a few hours after Ford, on Monday evening, General Motors announced its own open developer program (again, cleverly titled “GM Developer Program”), which links up to the new version of its MyLink infotainment system. MyLink isn’t yet available in vehicles; we’ll first see it roll out in select 2014 models in the upcoming year. However, developers can start creating apps for the platform right now. GM's open developer program works with the new version of its MyLink infotainment system. Unlike Ford’s program, GM is looking for developers who will “create a new category of apps”—apps that interface directly with the vehicle and help drivers know more about their car. So GM is asking developers to create apps for its infotainment system, rather than create mobile apps that simply work with its infotainment system. GM hopes to see third-party development of vehicle-specific apps, such as apps that monitor fuel efficiency and vehicle health. GM wants developers to create vehicle-specific apps to make car ownership easier. Ford and GM aren’t the only automakers interested in third-party app development. The Connected Car Consortium (CCC), which is made up of more than 80 percent of the world’s automakers, including Daimler, Honda, Fiat, BMW, Mazda, Mitsubishi, Toyota, Volkswagen, Renault, Ford, and GM, has created a global standard for smartphone and in-vehicle connectivity called MirrorLink. MirrorLink is a global standard for smartphone and in-vehicle connectivity, created by the Connected Car Consortium. MirrorLink is a technology that essentially replicates a smartphone screen on an in-vehicle infotainment system’s screen. Exactly how this is replicated depends on the individual automaker. MirrorLink can be customized to fit the overall look and design of each vehicle. MirrorLink technology lets mobile developers design mobile apps that will work in infotainment systems, without having to learn an entirely new platform. The CCC announced Tuesday that it will spend 2013 focusing on connecting with third-party developers in an effort to “saturate the global marketplace” with MirrorLink-enabled apps. The CCC plans to host a MirrorLink DevCon at Mobile World Congress 2013, where they will connect with app developers and explain guidelines, certification processes, and business models for the ecosystem. Livio Connect also wants to help mobile developers get their apps into cars in a safe, usable way. It's similar to MirrorLink; but unlike MirrorLink, which replicates (to a certain extent) the mobile screen on a vehicle's head unit, Livio Connect focuses on changing the mobile app's interface to suit the car. With the Livio Connect API, developers can put Livio Connect into their apps, so that apps can easily work with any car running Livio's OEM software. Livio Connect changes the mobile app's interface to suit the car. Livio's main focus seems to be on getting apps into cars, quickly. According to a Livio spokesperson, the company can get an app into a car (that's running its Livio software) in just 30 days--not the several months to a year, which is how long it often takes automakers. Livio stresses that it's not competing with OEM software such as Ford's AppLink or GM's MyLink, as it can work on top of these platforms. In fact, Chevrolet is using Livio Connect to bring the TuneIn streaming radio app to its 2014 Spark and Sonic cars. Livio also offers over-the-air updates to both the head unit and the Livio-connected apps. This way, both automakers and app developers can send software updates directly to customers' cars (the updates are delivered via a customer's smartphone data plan). Ford and GM are kicking off a trend that will soon include many of the world’s automakers. They’ve decided to take a leaf out of Apple’s, Google’s, and Microsoft’s books by opening up their platforms to third-party app developers—instead of trying to create all apps with dedicated partner companies such as iHeartRadio and Pandora. This is a good idea, if you think about where it’s taken the mobile app stores. Apple’s App Store and the Google Play store both have over 700,000 apps, while Microsoft’s Windows Phone store has around 150,000. Heck, even Microsoft’s newly-introduced Windows 8 store has more than 20,000 apps. By comparison, Ford’s AppLink system has a whopping three dozen apps. The open-source car represents a sea change in how cars are perceived and used. Cars have traditionally been pretty static pieces of technology, at least when it comes to the OEM. Aside from aftermarket modifications, there aren’t really any manufacturer-approved updates (hardware or software) to a vehicle you’ve purchased. An open-source, app-driven infotainment system changes all of that, because it essentially allows you to update your car’s head unit repeatedly. Just over a hundred years since the Ford Model T debuted, we’ve gone from getting any color car we wanted as long as it was black to getting (theoretically) any app we want, as long as it works with the car.